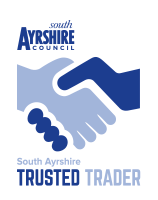 We are proud to be part of South Ayrshire Council's Trusted Trader Scheme. Trusted Trader is a directory of local businesses that have been vetted by Trading Standards and who made a commitment to treat their customers fairly. Read what our customers have to say! Thank you very much for installing our shutters. I love them and you and your team left an excellent job. Many thanks for a job well done. We are delighted with the shutters. They look great - you get 10/10! We never thought shutters would make such a beautiful feature in our home but your guidance and knowledge reassured us they would work - and they do, perfectly. Thank you so much. Fantastic job. Will be in touch once our extension is complete - shutters will be perfect for our bi-fold doors to the garden.